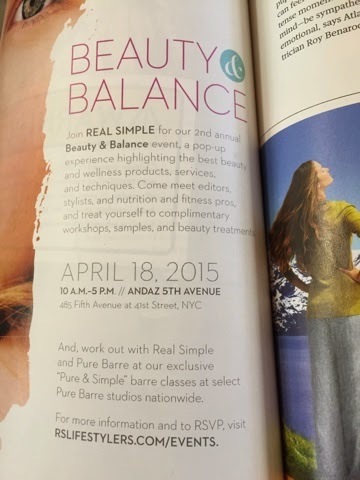 Browsing through one of my fave magazines, Real Simple, I was excited to see this awesome event they're hosting in NYC on April 18- Beauty & Balance. I'm all for Beauty and who doesn't need a bit more balance in their life? Check out Rslifestylers.com/events for more details and RSVP info! They have PureBarre classes from 10AM to 4 PM. They're also hosting at 11 AM a special cooking demo, called New Healthy Pantry Cooking demo and breakfast. RSVP here. At 2 PM, learn Beauty 101 tips with the Real Simple Beauty Editor. RSVP here. RSVP for ALL events here. Really wish I could make it there but alas, I'm no longer there.. Would Real Simple be kind enough to send me a goodie bag anyway? :) All guests will get a special gift bag! Great thing though, is their partner Pure Barre is offering complimentary classes for those outside of NYC :) Get more details here and to find a participating studio near you!